Fire arrows are in everything from Gladiator to Braveheart to Game of Thrones. The good guys stretch their bows in unison and rain flaming death en masse onto the opposing army, looking like total badasses the whole time. 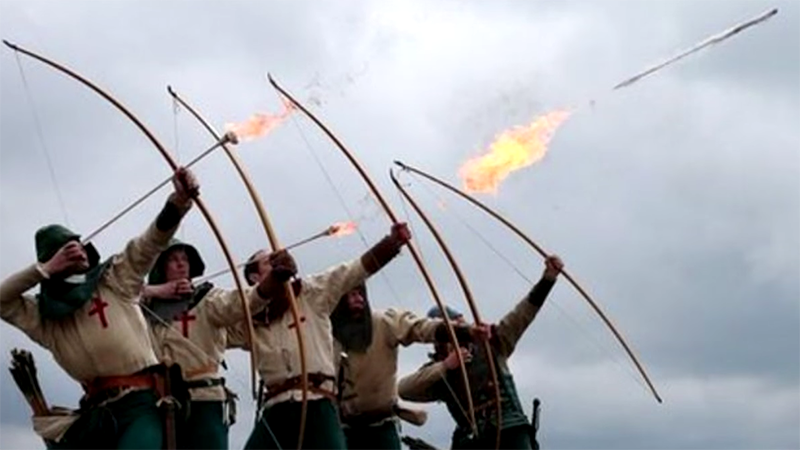 But like so many things on this terrible planet, fire arrows are too good to be true and almost no Medieval army actually used them in open warfare. As Lindybeige explains, there were three core properties that made arrows appealing to the armies of old: range, rate of fire, and the ability to pierce armor. Modifying an arrow to stay on fire through its entire flight has a negative impact on some or all of these attributes. For starters, think about wrapping a normal arrow in cloth or pitch and setting that ablaze. Once the arrow is drawn back, it’s going to do the most damage to the bow and your own hand. Not good! A longer tip or shaft solves this, but adds more weight and therefore less range, or makes arrows too fragile. Not to mention that a sharp pointy thing is far more effective against armor than an on-fire not-so-pointy thing. Guys in full-plate armor don’t immediately go up in flames like they do in the movies when getting hit by a tiny burning stick. As Lindy notes, tests have been done on reconstructed fire arrows to see which chemicals were best for A) keeping the arrow lit while in flight and B) causing the target to actually catch fire. At best, the success rate was measured at around 2%. This could have been somewhat useful during late Medieval naval warfare—where there was a chance of hitting a sail or a store of gunpowder—and to a lesser extend during sieges by the invading army. But at best, fire arrows were meant to pester and distract rather than cause meaningful damage, and weren’t ever put into regular use. Sorry for ruining about 800 of your favorite movies!